The special prosecutor’s team looking into a massive opinion-rigging scandal requested an arrest warrant for South Gyeongsang Province Gov. Kim Kyoung-soo late Wednesday over allegations that he colluded with a power blogger to manipulate online comments in order to sway public opinion on political issues. The independent counsel team led by Huh Ik-bum requested an arrest warrant for Gov. Kim around 9:30 p.m. Wednesday on suspicions of obstruction of business. The prosecutors view Gov. Kim, President Moon Jae-in’s close associate, as an accomplice of Kim Dong-won, a blogger known as Druking, who is currently standing trial over obstruction of business for using illegal automated software to generate fake online comments, among other charges. About an hour after the investigators sought the arrest warrant, Gov. Kim expressed regret in a Facebook post. According to the investigation team, Druking introduced the automated software King Crab to Gov. Kim when he visited Druking’s team in Paju, Gyeonggi Province, in November 2016. After that meeting, Gov. Kim started sending URLs of news articles to Druking, who would then use the automated program to create manipulated comments that favored the liberal Democratic Party, the investigators said. Gov. Kim admitted that he had visited the team’s headquarters in Paju, but flatly denied other allegations. Gov. Kim insists he was never introduced to the automated program there and had only sent the news articles because he thought it would be good for Druking. Seoul Central District Court will review the request early Friday, and the result is likely to come out late Friday night or early Saturday. Wednesday’s decision comes after the special probe team conducted two overnight questioning sessions, on Aug. 6 and 9. Gov. Kim, who was elected to the post in the June 13 local elections, is also suspected of having violated the election law by allegedly asking the blogger Druking and his organization to help him win the governor position. In return, the governor is accused of having promised a consular representative position in Japan. The ruling Democratic Party strongly criticized the independent counsel team, saying the warrant request was politically motivated. The Liberty Korea Party hit back at the ruling party’s reaction. 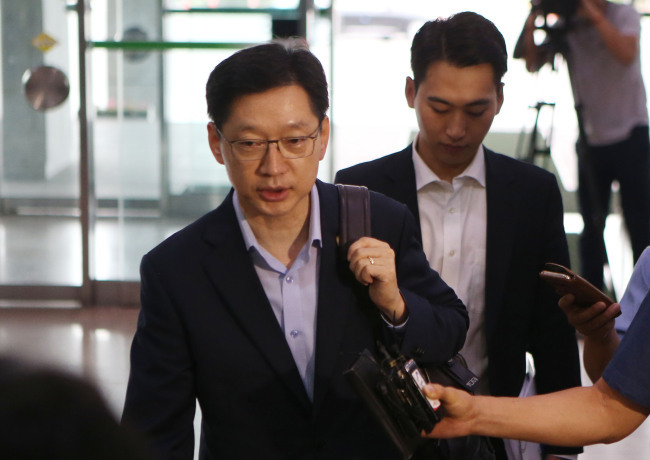 “It is unacceptable that the ruling party is discrediting the independent counsel team, which it also approved of,” the party’s spokesman Yoon Young-seo said. The conservative party also called for an extension of the operation period of the investigation team, which is due to end on Aug. 26.